In a world in which racism, violence, illness, and poverty seem to overwhelm us so that we often close our eyes—and our hearts—to the suffering around us, we may not believe we have the power to change things. 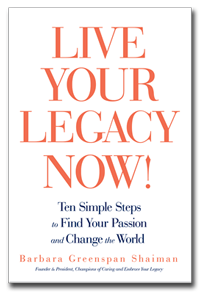 As Barbara Greenspan Shaiman shows in Live Your Legacy Now! this simply isn’t so. This part memoir and part how-to guide provides the tools and strategies to help you create meaningful change in your own life as well as in the lives of others. Live Your Legacy Now! provides a simple formula to help people of all ages and backgrounds to live a richer, more meaningful life by creating projects for personal growth and social change.